Ever watched a movie or television program and wonder what goes on behind the scenes? Well why not live the LA. dream and go behind the scenes of Hollywood with a Warner Bros. Studio Tour. Hollywood has had such a huge impact on pop culture all around the world. So experience the glitz and glamor of Hollywood and the rags to riches stories with a Warner Bros. Lot VIP Tour. Aspen Colorado is one of the world’s largest and most famous ski resorts. Nestled in the higher ranges of the Rocky Mountains, its exquisite natural beauty, snow capped mountains, ski resorts, forests, festivals, Victorian architecture, celebrities, and historical background make Aspen a place that must be experienced. For the ultimate scenic drive in the United States, follow Route One through the Big Sur area and take in the California coast the way it is meant to be experienced. 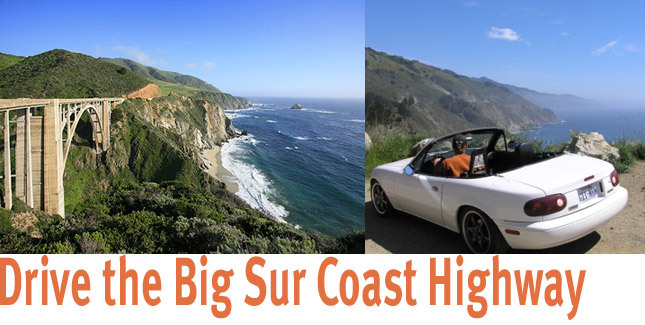 The Big Sur Coast Highway with its bends and curves hugs the rugged and awesomely beautiful California coastline for 72 miles (144km), providing access to austere, windswept cypress trees, rolling fog, sheer rocky cliffs and the crashing surf of the Pacific Ocean. Endless sun, pristine beaches, and monster waves. Hawaii, the home of surfing, is America’s surfing Mecca, and one of the premiere surfing destinations the world over. Hawaii has great surf most places, but if you want to call yourself a world class surfer you have to make it on the North Shore of Oahu. The North Shore covers almost 20 miles (32 kilometres) of beautiful open sandy beaches, including legendary beaches like Sunset Beach, Ehukai Beach, and Pupukea Beach, and where you will find the world famous Banzai Pipeline. A spot where the shallow water and coral shelf combine to create powerful tubular waves that resemble pipes, thus giving the place its name. For sheer adrenaline, power, beauty and danger, Pipeline has no equal. Surfing the Pipeline is an invigorating experience, but you’ll have to wait in line to ride some of the incredibly huge waves that break on these shores. And if the surf’s up, beware! The Pipeline at full strength is unforgiving, even for the pros.